“Doing what can’t be done is the glory of living.” So wrote Anita Willets-Burnham in Round the World on a Penny, which documents two extraordinary trips made with her family in the 1920s. Artist-traveler-writer-lecturer, Anita Willets was born in Brooklyn, New York but raised in Chicago. She studied art at the Pennsylvania Academy of Fine Art at Philadelphia and at New York’s Art Student’s League and National Academy of Design before returning home to teach at Chicago’s Art Institute. The North Shore Art League grew from informal classes she conducted out of her suburban home in Winnetka. 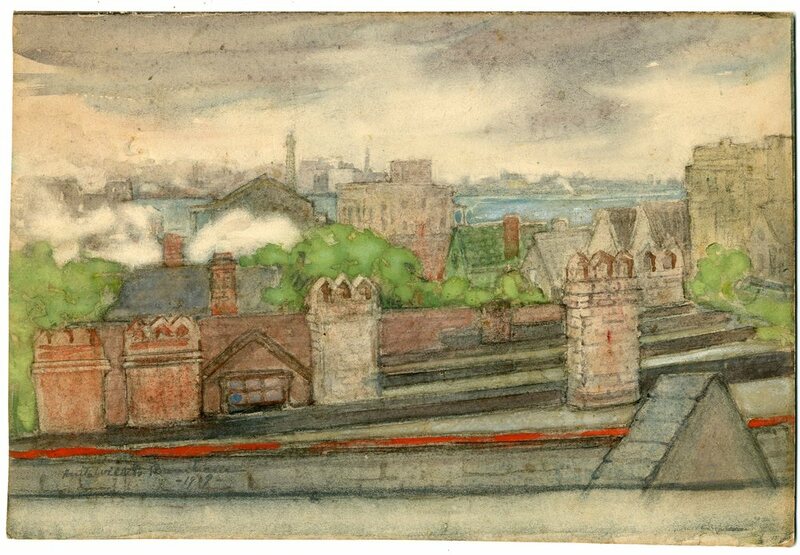 Burnham’s watercolor “Chicago from a Roof Top” shows the skyline from her apartment near the lakeshore on the city’s south side. She has written on the back: “5th floor and climb / From the roof of our apt house called The Palace / 44th Place and Oakenwald Ave Chicago / We called our apt ‘The Sky Parlor. '” Though the work is dated 1909, it was shown in the Art Institute’s annual exhibition of 1916. The Community Collection received it that year from Burnham herself, a gift to honor her acquaintance with Agincourt architect Anson Tennant, who was thought to have died the year previous. Burnham and Tennant probably met at the Art Institute while he studied architecture there in 1910-1912; the Tennants also own an autographed copy of Burnham’s book. By agincourtiowa in Landscapes & Livestock, Uncategorized on Saturday/11/May/2013 .